The Deputy Minister designate for one of the newly created regions, Ahafo region of Ghana, Hon. 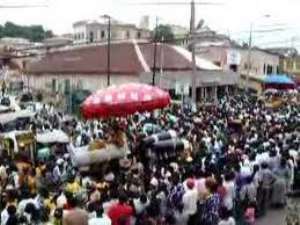 Benjamin Yeboah Sekyere, has assured that his office will in no way interfere with chieftaincy issues in his region. He said he respects traditional institutions and would not do anything that will create any division and chaos. Hon. Yeboah Sekyere made these known when he came before the Appointments Committee of Parliament (ACP) for his vetting process. The Deputy Minister-designate upon responding to answers from the (ACP) regarding what the natives of Bechem should expect from him as the minister, he said he has plans of beefing up the educational status in Bechem and it's environing to regain the educational status it used to have. "Bechem would get as much as they deserve," the minister-designate said. Answering questions by the ACP on stating three challenges he has encountered on his job in the teaching field, Hon. Yeboah Sekyere said the challenges he identified in the region are infrastructure, lack of quality education and believe in the study of science and technology. "I would seek the assistance of counselors to educate the youth especially the girl child in capacity building, create an Avenue for sensitization of the youth on educational programs". "If I am given the nod as Deputy Minister, I would work hand-in-hand with my minister to use the appropriate channels to help the right offices to solve the chieftaincy issues in the region," Hon. Yeboah indicated. "We will ensure that the House-of-chiefs would be given necessary arrangements and supports to solve these problems," he said. He stressed that "we will do our best not to interfere in their chieftaincy issues". He answered the questions on cashew plantation as saying that "we would give incentives such as land and fair share if farm implements to our people so as to encourage them to venture more into cashew plantation". "I would help my minister to maintain peace and security in the Ahafo region". Hon. Yeboah Sekyere answering one of the questions from the ACP on waste management said although we generate many tonnes of waste, we lack how to manage these waste, Ghana, therefore, need to improve on the final disposal and the treatment of waste properly. Hon. Yeboah Sekyere disclosed that government is having a road map towards Galamsey, "so we would adhere to it and see to it that tackle Galamsey issues appropriately "we should not use human faces, but rather see to it that the laws work". Giving answers on revenue mobilization, the Deputy Minister-designate said revenue mobilization form key aspects of the assemblies, and therefore need to be managed through newly developed new strategies. "Government properties must be valued; "we have the potential of the funds, we raise in the MMDCs, MDCs, and District," he said. Hon. Yeboah Sekyere outlined two things that lead to the "none payment" of property rates as attributes to political expediency and lack of evaluation of the properties. "There should be sensitization and intense education, and the engagement of Special planning department to supported to ensure that proper arrangements are done to that effect". "We will as well keep track on internally generated funds- we have to ensure that the laws and rules work towards what the monies taken are used for". He also urged parents to study their wards during their developing stages to know if they are slow learners or not. The Minister-designate encouraged parents to engage good counselors and child psychologists to handle the intelligent quota their children.